I have covered a few time tracking applications on this site. 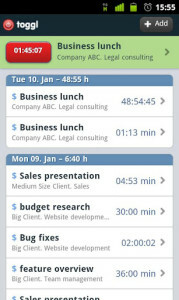 Including WorkTimer for iPhone, OnTrack for Windows Phone, and Billable Hours for Blackberry. 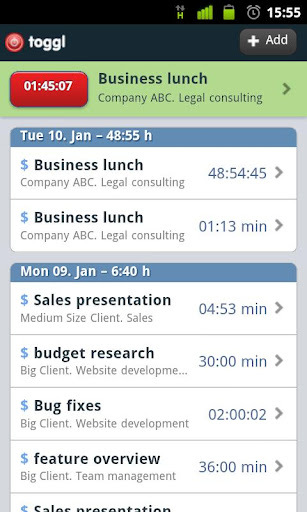 Am I obsessed with time tracking applications? No, well not really. The reason I include so many is because they are so important for business users and especially for freelancers and consultants. We live and die on our billable time and we don’t want to lose a minute of it because that means money out of our pockets. We also don’t want to over bill because that could label us as dishonest and destroy our credibility. So now we have Toggl for Android and iPhone. I personally use this application at the moment on my Samsung Galaxy S3 and it works perfectly. For me, the addition of a web based version is critical. I don’t want to have to dig out my phone if I’m at my desk in order to log time. Toggl is very affordable at $5 per user per month but they also have a free version which will be sufficient for many people. Toggl allows you to create multiple clients and projects which is vital when it comes to itemizing charges and creating invoices. The mobile app does exactly what you need. You can start a timer and fill in the details later. Or you can manually put in the time that you worked. You can also flag it as billable or not. This is helpful if you want to track where your time is spent but you don’t plan on billing the client for the work. I use this feature for included maintenance which is not billable. You can then go to the web and run reports. Some may say the ability to run reports should be on the mobile app, but I personally wouldn’t use that feature. The mobile version of Toggl is very useful for what it does and I don’t need other unused features cluttering things up. You may disagree and if you do…then Toggl may not be the app for you. Toggl has a clean interface and is very quick and responsive especially considering that it is syncing with the Toggl servers. If you don’t already have a mobile time tracking solution or if you are looking for a new one, then give Toggl a try… you may be surprised at how much you use it. Try Proofhub.com as well. It is similar to toggl but offers more features and services. Give it a go.